Automate workflows for efficient data collection using Zoho Forms. Connect your forms to various applications and address all your business needs with Zapier. All you need to do is Zap it up. Zaps are connectors that integrate your forms with other apps. They're simple and can be set up in minutes. Depending on how you set up your Zaps, every new form submission can trigger different actions such as sending instant alerts in your chat tool, assigning tasks based on form responses, or updating contacts and leads in your CRM. And guess what? Zoho Forms integration with Zapier requires no coding knowledge. Connect your forms to a whopping 1000 applications. How workflow automation works wonders for your business. Seamlessly address every business need using a Zap - whether it's sharing forms with respondents, notifying users, collaborating with coworkers and analyzing form data — Zoho Forms Zapier integration has it all. No matter what your business vertical is-human resources, construction, ecommerce, or education-our forms can address every vertical with automated workflows facilitated by Zapier automation. Use each Zap to collect valuable information for your business. Automate Zapier into your workflow and analyze its effectiveness. 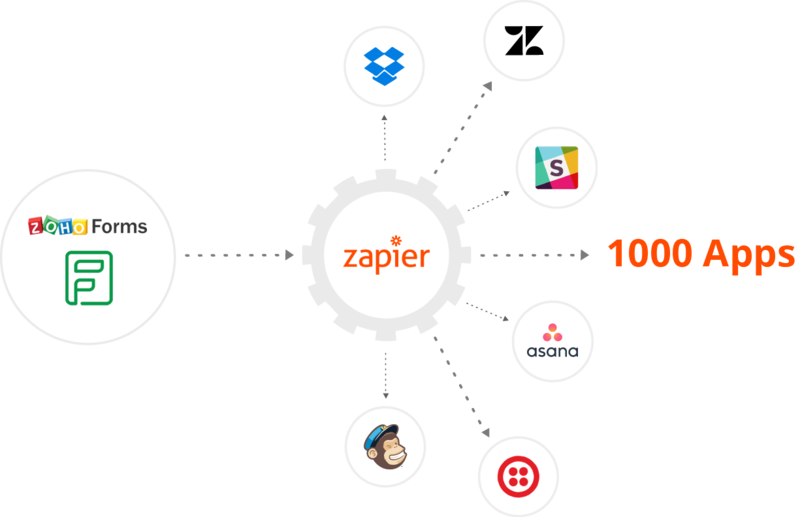 Increase your form responses through Zapier integrations. Affordable pricing for amazing features. Custom Themes and Templates to create attractive forms. A wide range of form fields, such as text boxes, multiple choices, radio buttons, payment fields, file uploads, and more. Field and Form rules to help you build smart forms. Email alerts, PDFs of form responses, redirection to custom thank-you pages, and more. Tasks and Approval workflow for a more efficient and productive workflow. Multiple ways of sharing forms, including HTML links, iframe, JS codes, and pop-ups. Sharing via social media platforms such as Facebook, Twitter, LinkedIn, and Google+. Mobile Apps for both iOS and Android devices with offline support.